There are places and moments on Earth where natural phenomena of such stunning magnitude and beauty occur that they shatter all notions of a world of human scale. This is what draws the Inuit families of Arctic Bay north to their summer camp at the tip of Baffin Island each year. Every winter in the Arctic, however, virtually all of the sea between the islands of the Arctic archipelago lies frozen, a single horizon of ice that joins the polar cap and eventually covers 15.5 million square kilometres, twice the size of the United States. As temperatures drop to as low as -57 C, of all the marine mammals only polar bears and ringed seals remain, the latter dependent on breathing holes scratched through the ice. Polar bears survive by stalking the seals throughout the long Arctic night. 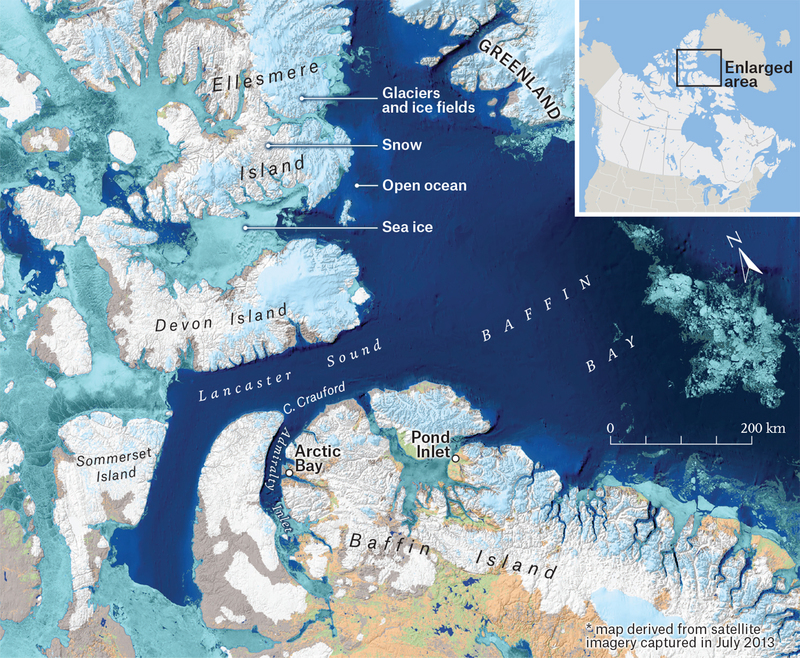 Other marine mammals — belugas, bowhead whales, walrus and narwhals — head out through Lancaster Sound to the open waters of Baffin Bay and Davis Strait, between Canada and Greenland. Only small populations overwinter in rare pockets of open water kept ice-free by the action of winds and currents. In spring, the animals return, wave upon wave, hovering against the retreating ice edge. The winter population of some 100,000 mammals soars in the summer to 17 million. Foraging in rich waters, they await a chance to disperse to feeding grounds scattered throughout the Arctic. In the long hours of the midnight sun, brown algae bloom beneath the ice, billions of shrimp and amphipods flourish, and millions of cod thrive on the zooplankton. A quarter of a million harp, bearded and ring seals feed on fish, as do thousands of belugas and narwhal. A third of the belugas in North America and three of every four narwhals on Earth gather here. They in turn fall prey to roving pods of killer whales. By June, the waters of Lancaster Sound are free of ice. But those of Admiralty Inlet, 48 kilometres wide at the mouth, remain frozen. From the Inuit camp at Cape Crauford, it’s possible to travel along the floe edge, where the ice meets the sea, and listen as the breath of whales mingles with the wind. There is no night and no morning, only the ceaseless sun. In what passes as evening, one can scramble up a high escarpment that leads to a promontory overlooking all of Lancaster Sound. The sense of isolation and wonder is overwhelming. Every horizon shimmers with mirages. Low islands seem like towering cliffs, ice floes appear as crystal spires. The land seduces with its strange beauty. Upon the ground are ancient graves, human bones covered in lichen and moss. Around the bones is a circle of life, purple gentians and dwarf willows, small plant communities established long ago on the rich nutrients of the dead. A ring of flowers around an eider’s nest, a seedling growing out of the droppings of a gull, lichen slowly eating away at rock, an inch of soil taking a century to accumulate. In the Arctic, one marvels at the art of survival. Bears hunt seals; foxes follow the bears and feed on their excrement. Inuit women cut open animals to feed on clam siphons found in walrus stomachs, lichens and plants in the guts of caribou, and mother’s milk in the bellies of a baby seal. The Inuit do not fear the cold; they take advantage of it. A moist skin left overnight becomes a shovel by dawn. A knife can be forged by the cold from human excrement. The runners of sleds were originally made from fish, three Arctic char laid in a row, wrapped in caribou hide and coated with a thin film of ice. A sled could be made from the carcass of a caribou, with crossbars of frozen char and walrus meat cut to the right size. If things got tough you could always eat your sled. Along the floe edge one morning, I watched as a young hunter knelt over a dead seal, dripping fresh water into its mouth to placate its spirit, even as he hummed a song in praise of the animal. If animals are not properly treated, they will not allow themselves to be taken. But if they are not hunted, the Inuit believe, they will suffer, and their numbers will decrease. The hunt is a reflection of balance. Blood on ice in the Arctic is not a sign of death, but an affirmation of life itself. Originally published in The Story of Canada in 150 Objects, a special Canada 150 commemoration project by Canadian Geographic and The Walrus, available now on newsstands and online.